Brussels- Belgium's Quirky Capital | Travel? Yes Please! Those are all statements I made over and over again as we wandered around Brussels, Belgium’s quirky capital city. Brussels is probably the most unique place we visited on our five week trip to Europe. The city gives off an eccentric vibe and does not take itself too seriously. It is unapologetically cheeky. It’s pretty common for cities to accent their parks and squares with statues of prominent political and historical figures. But in Brussels, the most famous and beloved statue is that of a little boy peeing. 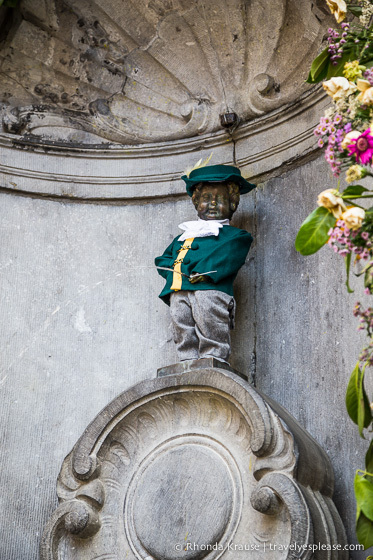 The Manneken Pis, first displayed in 1619, has become an emblem of Brussels’ zany and rebellious spirit. During big events, the city dresses up Manneken Pis in some pretty luxurious outfits. In fact, Manneken Pis is so important that he is regularly given costumes and gifts from different countries and important visitors. He has over 900 costumes, 100 of which are on display in the city museum. Manneken Pis all dressed up for the Belgian Beer Weekend. The statue you see today is a replica because the original version has been stolen many times. The original restored version is now safely kept at the City of Brussels Museum/Maison du Roi on the Grand Place. 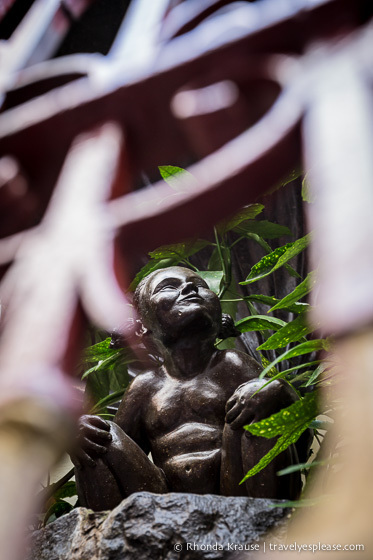 A modern counterpart to Manneken Pis, is Jeanneke Pis, a female peeing statue. She is not as popular and is tucked away in a narrow cul-de-sac behind bars to protect her from vandalism. Then there was this strange statue of a smurf riding a mushroom. This was our view from our hotel room. Besides odd-ball statues, Brussels also has a large collection comic strip street art. Over 50 comic strip murals embellish the walls of Brussels’ buildings, showcasing Belgium’s most famous comics. The Atomium is one of the strangest places I have ever been to. I don’t even know where to begin! Built for the World’s Fair, Expo ’58, this 335 ft tall atom has become an icon of the city of Brussels. It’s nine large spheres are connected with tubes to form the shape of a unit cell of an iron crystal, magnified of course, to 165 billion times. It’s a very cool looking structure from the outside, but the inside is another story. I definitely felt like I was in a time warp back to the 1950’s. But not the soda shop, sock hop, poodle skirt wearing 1950’s- the cold war, space race 1950’s. In five of the spheres are different exhibits, some permanent, some temporary. The permanent exhibit is dedicated to Expo ’58 and also tells the history of the Atomium. The temporary exhibits were some very less than impressive “art” displays and a strange light show complete with an eerie, robotic soundtrack. (See the video at the bottom of the post). Light show and inside one of the tubes connecting the spheres. The Atomium is such a unique building and is worth seeing from the outside, but you wouldn’t be missing out on much if you didn’t go in. I left there thinking it was very weird! Plus the view from the top isn’t anything special. The Atomium is surrounded by Mini Europe, a park, and some very sterile looking buildings. Brussels is a place that left me scratching my head. I’m still not really sure if I liked it or not. It’s not as if we had a bad time, because we didn’t. We had fun wandering around seeing all the unusual statues, indulging in waffles and chocolates, and trying the frites with mayonnaise (even though I was not a fan of that combination). Brussels is just a place that I didn’t really connect with. I think Mike enjoyed it a little more than I did. I don’t regret going to Brussels at all, but I also don’t think that I would visit again. Once was enough for me to get a good sense of what the city is all about and to see all I wanted to see. Manneken Pis is located at the junction of Rue de l’Étuve/Stoofstraat and Rue du Chêne/Eikstraat. To find it from the Grand Place, take the left lane next to the Brussels Town Hall and walk a few hundred metres. Jeanneke Pis is located on the east side of the Impasse de la Fidélité/Getrouwheidsgang (Fidelity Alley) leading northwards off Rue des Bouchers/Beenhouwersstraat. The Comic Book Route lies mostly inside the city centre (or the Pentagon as it’s often called). The Atomium is located in the Northern part of Brussels, a 5 minute walk from the Heysel/Heizel metro station (line 6). The Atomium is open every day, from 10am until 6pm (ticket office closes at 5.30pm). Entrance fees are €11 for adults, €8 for teens, and €6 for childer aged 6-11. Hours are shorter during the Christmas season. Be prepared to stand in line for a while as there is only one tiny elevator to take visitors up to the main sphere. There is a snack bar on the ground level and a restaurant in the upper sphere. * All prices and hours were correct at the time of publishing. Please confirm costs and times directly with service providers.